Special Note: Need to be organized to marinate for 30 minutes ahead of time. In a large bowl, whisk together all of the ingredients for the shrimp marinade. Set aside. Rinse the cleaned shrimp under cold water then lay out on paper towels and pat until completely dry. Add shrimp to marinade and cover the bowl. Refrigerate for 30 minutes. 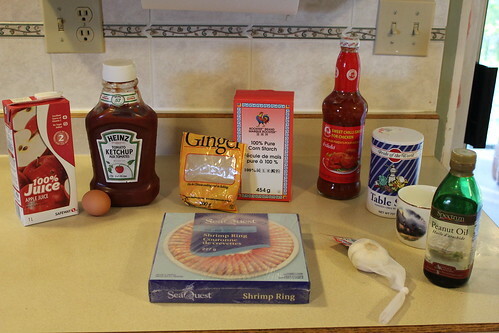 While shrimp are marinating, prepare the sauce by whisking together all of the sauce ingredients in a large bowl. Set the prepared sauce aside. Place the 1 cup of cornstarch in a large bowl. Add the marinated shrimp to the cornstarch, tossing to evenly coat. Transfer the coated shrimp to a colander and shake off any excess cornstarch. Place a large, deep sauté pan over medium-high heat. Let it sit for 2 to 3 minutes until it is very hot. Add the peanut oil it should slide very easily across the pan but not smoke). Add half of prepared shrimp to the pan, spread out so they aren't touching each other. Allow them to cook 2 minutes, then flip them once and cook on the second side for 1 additional minute, or just until they turn pink and are fully cooked throughout. Remove the shrimp with a slotted spoon and transfer to a plate lined with paper towels. Repeat the cooking process with the second half of the shrimp, adding more oil to the pan if necessary. Drain the excess oil from the pan and then allow the pan to cool before returning it to the stove (this is very important). Return the pan to the stove, placing it over medium heat. Add the prepared sauce and bring it to a boil. Add the cooked shrimp to the sauce and toss to evenly coat. Spoon Crackerjack Shrimp into dishes and serve. Recipe adapted from the Los Angeles Times.